Looks can be deceiving. These look easy, but they’re pernickety and a little tricky. Don’t let that deter you though; if we can do it you absolutely can. It can be a little difficult to find lollipop sticks last-minute (the internet is your friend if you have time and forethought!) and it’s also a delicate balance of keeping two chocolates hot then getting them assembled within time which proves tricky. Once you get the rhythm, you’re laughing, and this is one sweet, sweet pay off. These can easily be made one, even two days beforehand. 1. First, melt the white chocolate. It will be quicker to do, and it’s easier to keep warm. Microwave or bain-marie is your decision, we used the latter. To keep the chocolate warm once melted, decant into a smaller bowl, which you can sit in a bigger bowl filled one quarter with warm water. 2. 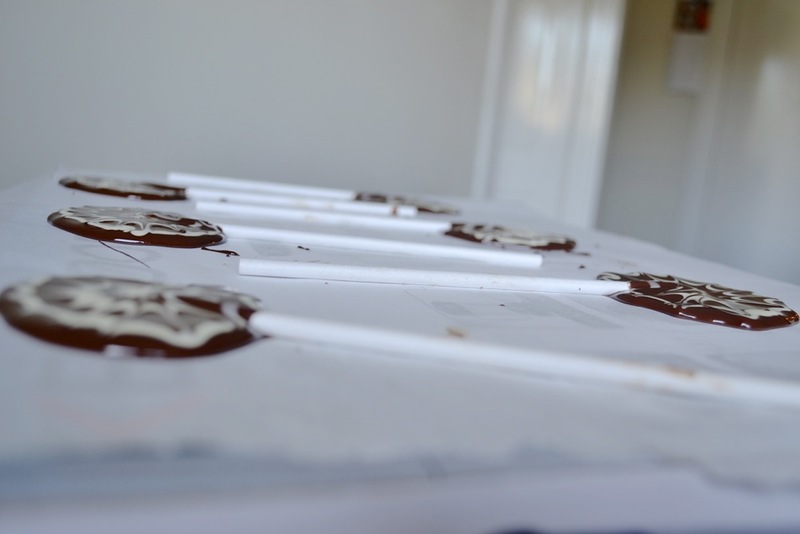 Now, move onto the darker chocolate and prepare a baking sheet with some parchment on top in another area. 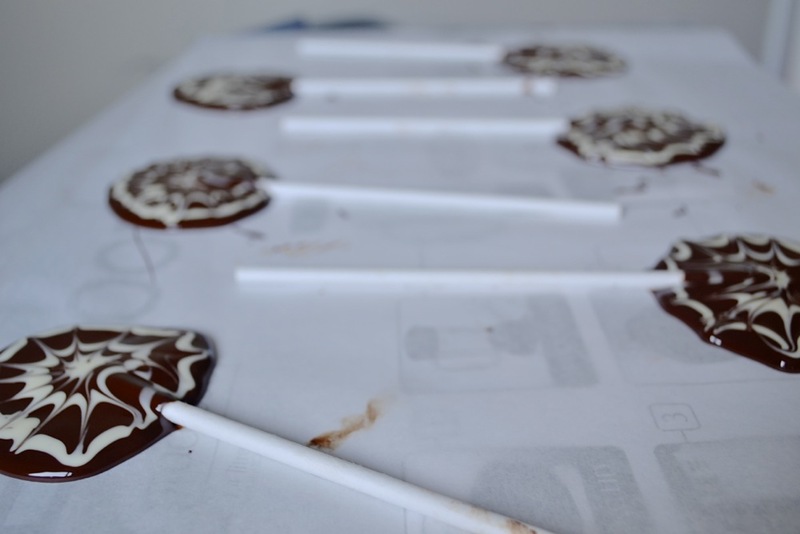 Set up your toothpicks and lollipop sticks with the piping bag in position. 3. After all the chocolate has come to a simultaneously liquid consistency, move into position. Dot and spread about 2 tbsp of the darker mix onto the lined baking sheet to make individual rounds. You should get 10-12 from that mix. 4. 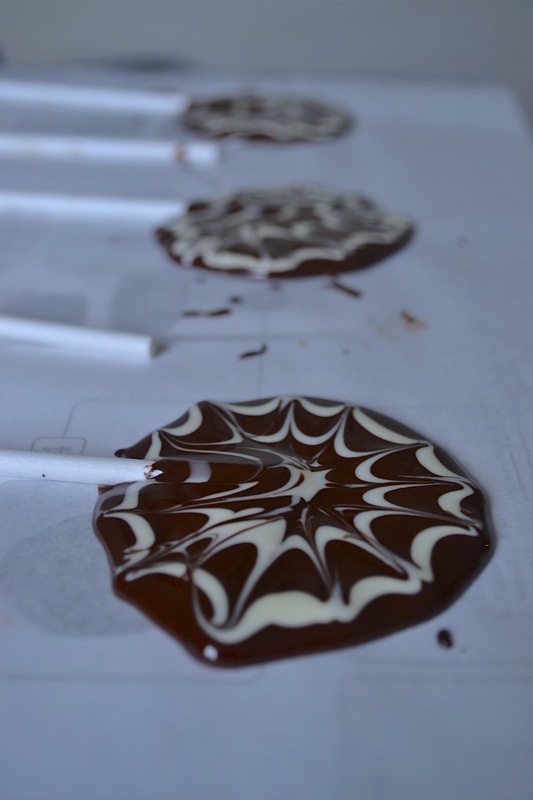 Now, fling the darker chocolate mix away, and focus on the white. Pour into your piping bag and twist into position. You need to make three circles in the chocolate, starting with a dot in the middle of each chocolate round, with a bigger one around that, and then a bigger one again around those two. 5. Working quickly, get your toothpick and flick the toothpick from the central dot out to the sides, around each circle of chocolate like the arms of a clock. 6. 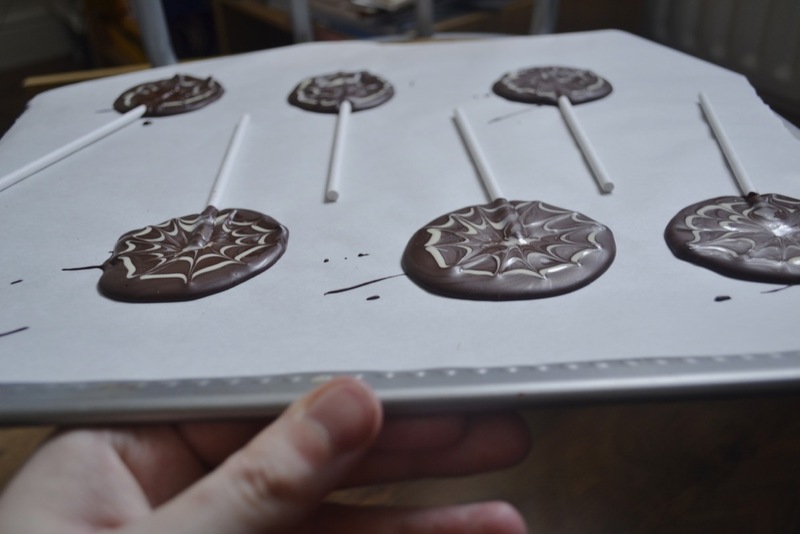 When all your rounds are made into makeshift spiderwebs, then insert the sticks towards the middle of each round and swirl slightly until coated in the chocolate, but careful not to mess up your design. 7. Leave in a cool place and they should be hardened and ready to eat in about an hour! A proper balance between scarily sweet white and devilishly dark chocolate; these are kitsch, fun and perfect to satisfy any crazy chocoholic! For lots more Halloween recipe ideas, check out our Halloween master post.